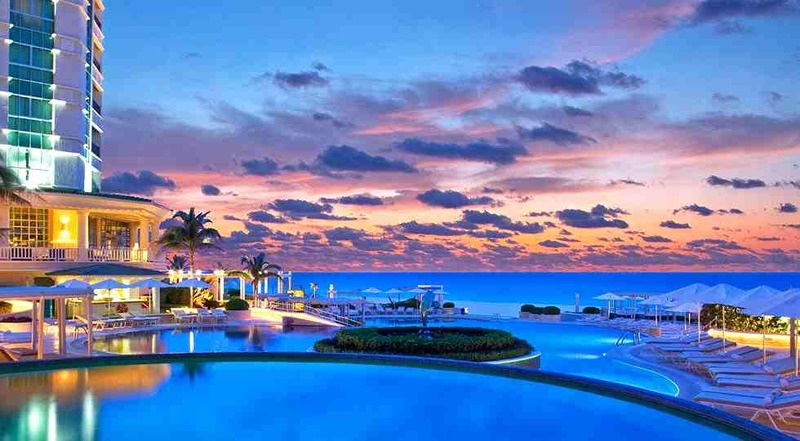 Cancun, Mexico offers a fantastic opportunity for an unforgettable, luxurious tropical vacation. 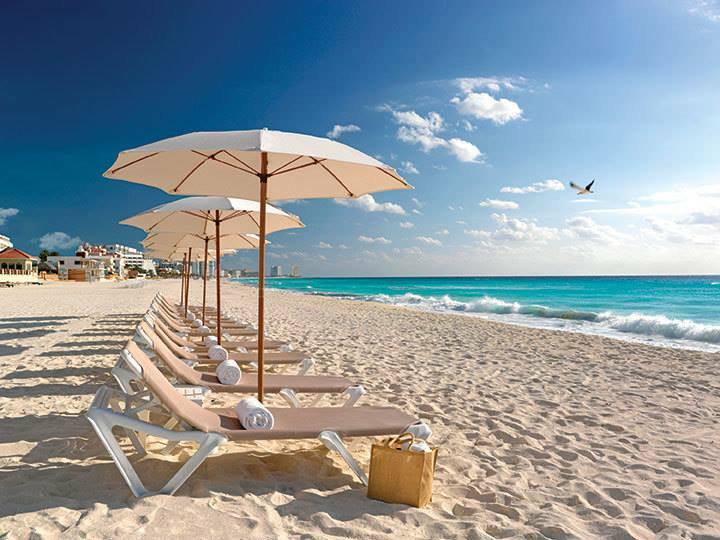 Cancun has gorgeous white sand beaches, with the famous turquoise blue of the Caribbean Sea. This popular tourist destination is also known for its vibrant nightlife. The city has a multitude of hotels and resorts to choose from, but if you're looking for an all-inclusive resort, the Paradisus Cancun merits serious consideration. Paradisus Cancun is an all-inclusive, luxury mega-resort located in Cancun's Hotel Zone, with the Caribbean Sea to one side of the resort and the Nichupté lagoon to the other. Cancun's incredible nightlife is about a fifteen-minute trip by car from Paradisus Cancun. The international airport in Cancun is roughly a half-hour drive from the resort. Paradisus Cancun is a breathtaking resort. The guest rooms are spread between five pyramid-shaped buildings, each capped with green glass. The largest pyramid includes a magnificent interior garden, complete with koi ponds and vines cascading from balconies. Pools run nearly the length of the resort. Guest rooms and suites have plenty of room and private terraces overlooking either the beach or the lagoon. Rooms facing the lagoon have sunset views. Decor in Paradisus Cancun guest rooms is colorful and elegant, with unique touches like original artwork. The bathrooms can feel just a little crowded when compared to the bedrooms, but the water pressure is excellent and they are stocked with luxurious, high-end bath products. La Palapa is available only for guests who have opted for the Royal Service VIP package. This restaurant serves a la carte international cuisine. Tempo, headed by the Six Star Michelin Chef Martin Berasategui, offers contemporary Basque cuisine in an elegant atmosphere. There may be additional charges for this restaurant. Reservations are recommended at a la carte restaurants, particularly at peak times. YHI is Paradisus Cancun's Asian-inspired spa. The decor incorporates natural materials, like bamboo and slate, and includes water features. YHI has a relaxing lounge area, with daybeds where guests can enjoy infused waters. The listing of massage options includes an impressive variety. There is a fitness center located adjacent to the spa. Nightly accommodations begin at around $335 to $415, with some variation to be expected seasonally. Reservations can be purchased by contacting the hotel directly or through online vendors like Expedia and Hotels.com. Nightly accommodations begin at around $335 to $415, with some variation to be expected seasonally. Spacious guest rooms each have a private terrace overlooking either the Caribbean Sea or the lagoon, though some of the views are partially blocked by resort buildings. Rooms are stylishly decorated, often incorporating original art. This resort has excellent service. Paradisus Cancun features spacious guest rooms, fantastic views, superb dining and a remarkable spa with an impressive range of massage options. Breakfast can feel a little crowded, and reservations are needed to get seated at a la carte restaurants during peak hours. Paradisus Cancun is one of the most cost-conscious options we have compared, but it has striking architecture, fine dining, a luxurious spa and excellent amenities. 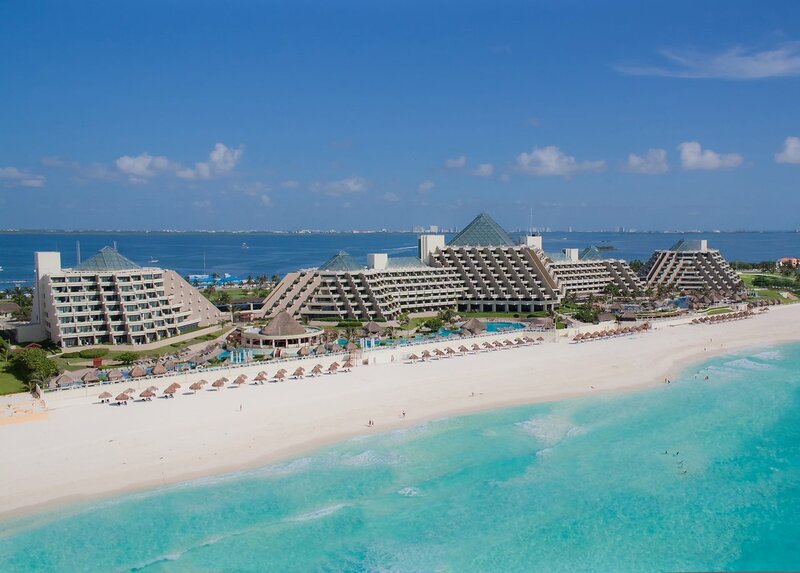 With a breathtaking white sand beach on one side of the resort, a lagoon view on the other, and the striking pyramids, the Paradisus Cancun has incredible views throughout the resort. Cancun's nightlife is only a short trip away by car. 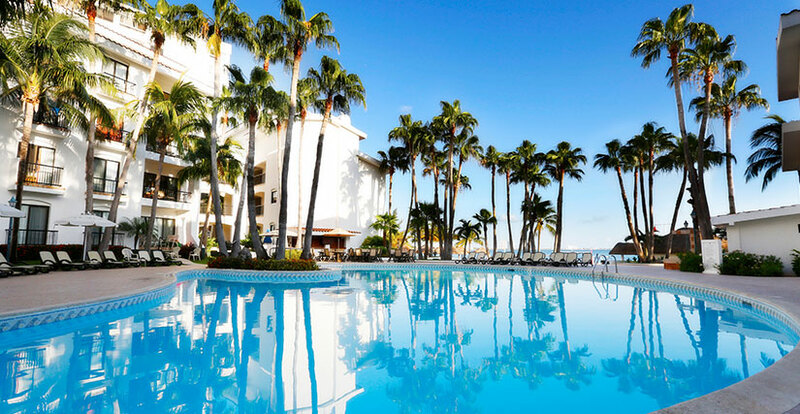 This all-inclusive luxury resort is adjacent to two white sand beaches and within walking distance of Cancun's nightlife. The resort offers a variety of options for drinking, dining, recreation and relaxation. The resort has eight restaurants, three lounges and six bars. Guests can enjoy the two beaches or swim in one of three infinity pools. For those who are interested in some pampering, there are many available treatments at the resort spa. Adult travelers have the option of staying in a tower reserved exclusively for adults, complete with its own rooftop infinity pool. Swim-up rooms are available as well. Nightly accommodation prices generally begin in the $350 - $400 range, with some variance to be expected seasonally. Guest rooms and suites feature furnished balconies and lavishly appointed bathrooms. The location and room quality are impressive, but those interested in resort-based activities beyond the pools, spa and fitness center may be disappointed. The eight restaurants offer a significant range of choices, but the quality of the food and occasionally the service fails to deliver on the full promise of a luxury experience. The inability of resort cuisine to impress guests consistently is a concern for those planning to dine exclusively at the resort. For those who were planning to visit nearby restaurants and bars in Cancun, this may be less of a concern. The resort's two white sand beaches and proximity to Cancun's incredible nightlife make this an excellent location. This large, all-inclusive resort on the new Mayan Riviera offers three separate resort areas, a golf course and a large main spa area. With twenty restaurants and bars to choose from, finding a restaurant that appeals to you should be easy. Beaches in this area can be covered with seaweed, but the resort has a number of pools, including a very large one with water slides and a FlowRider machine. The resort even has a dolphinarium where you can swim with dolphins. Nightly accommodation prices generally begin in the $375 - $500 range, with some variance to be expected seasonally. Guest rooms are decorated in a modern style that makes excellent use of textures. Most, but not all, rooms have balconies. This massive resort has the space to offer a wide range of amenities, including twenty restaurants and bars, numerous pools, a golf club, a kid's club area and the dolphinarium. The resort offers transportation to and from the hotel. 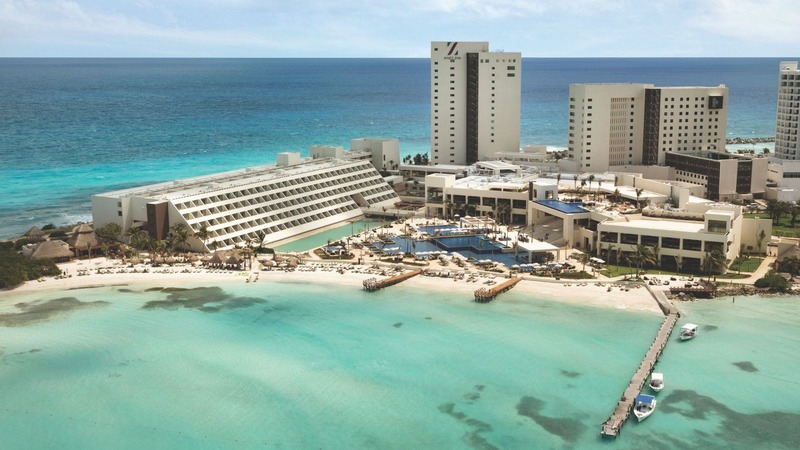 Though it doesn't lend itself to easily seeing more of Cancun, and despite not having the same gorgeous beaches as other resorts on this list, this resort offers quite a lot. It's a great choice for those traveling with children, looking for a wide selection of restaurants, or looking to play golf or swim with dolphins without leaving the resort. The location is secluded enough to feel like a world of its own, but it isn't in easy walking distance of anything outside the resort. The beaches on this section of coastline are often cluttered with seaweed and are not the lovely shade of blue found further north near the Hotel Zone. 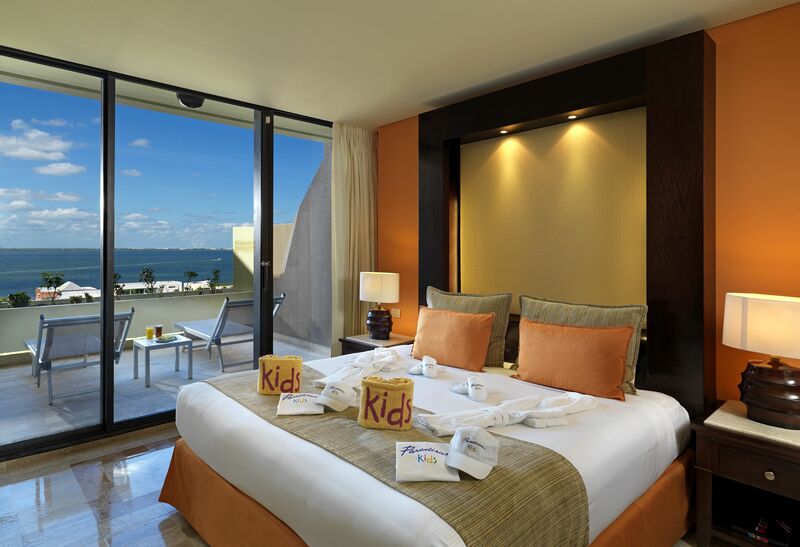 Beach Palace is a magnificent, family-friendly, all-inclusive resort located in Cancun's Hotel Zone. The hotel is next to a large white sand beach. Each guest room features a double whirlpool tub, a smart TV and a minibar stocked with sodas, juices, water and domestic beer. Beach Palace has an all-day activity schedule, including many activities for children and teens. There are three pools, including a main pool with a stage for entertainment, and a kid's pool with a water slide. For drinking and dining, there are four restaurants and numerous bars, three of which are swim-up bars. The resort spa is trendy and the fitness center has an ocean view. If you're looking for even more activities, tours and excursions can be booked through the resort. Nightly accommodation prices generally begin in the $350 - $475 range, with considerable variation between online offers. Some variance should be expected seasonally. Guest rooms all feature double whirlpool tubs, smart TVs and minibars stocked with sodas, juices, water and domestic beer. However, some elements of the decor are a little dated. Beach Palace offers a good amount of entertainment, particularly for children and teens. Transportation to and from the hotel is offered. Restaurant options are a bit limited in comparison to other resorts. For travelers looking to pack a lot of activity into their vacation, this resort has great value. If you don't take advantage of the impressive activity schedule and would prefer a more quiet vacation, this hotel has a bit less to offer. The hotel is located on a large white sand beach in the Hotel Zone. Paradisus Cancun is a great choice for many kinds of travelers, offering services that fit the needs of both adults and families traveling with children. For those who'd like an extra touch of luxury on their vacation, the Royal Service VIP experience offers even more service and an exclusive, adult-only atmosphere. Family Concierge rooms include special amenities for children. Paradisus Cancun offers a selection of outstanding restaurants. There are options to suit all tastes, and you can dine buffet-style or a la carte, depending on which restaurant you choose. There is also a range of dress, with some restaurants allowing any attire, some requiring formal attire, and most requiring resort casual. There are several bars, including a swim-up bar. Striking architecture and elegant decor make Paradisus Cancun a visually stunning resort. Though no resort in this picturesque location would be without gorgeous views, unique features like the massive indoor garden with koi ponds and water features make for marvelous interior landscapes. In guest rooms, the original art incorporated into the decor adds style and makes each room just a little different from the others. Paradisus Cancun truly deserves a 5 Star rating, based on its incredible location, remarkable guest rooms, fine dining and customizable service. Cancun offers an impressive selection of hotels, but Paradisus Cancun is a luxurious and unique resort that has something to offer everyone.